No matter where you are in the world today, one thing is for sure. Expectations for customer service have grown over the past few years: around convenience, speed, agent knowledge and insights, and by far around channel availability and digital transformation. 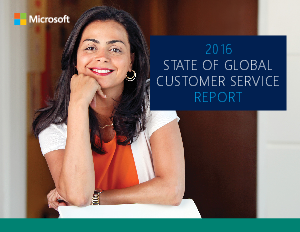 This year, Microsoft’s customer service preferences and expectations survey polled 5,000 consumers across Brazil, Germany, Japan, the United Kingdom and the United States and found some interesting commonalities, as well as distinct differences between locations. As a bonus to our polling, we also found some fascinating trends related to age groups, and we’re excited to share those with you as part of this year’s State of Global Customer Service Report. As customer service and the customer experience become key differentiators for brands and organizations across all industries around the world, it has never been more important to know as much as you can about these expectations, perceptions, preferences and trends so that your organization can not only move forward, but ahead when it comes to customer service and engagement.